Our summer project has officially come to an end! That’s right, we finally completed our exterior. Insert all the happy face emojis here! 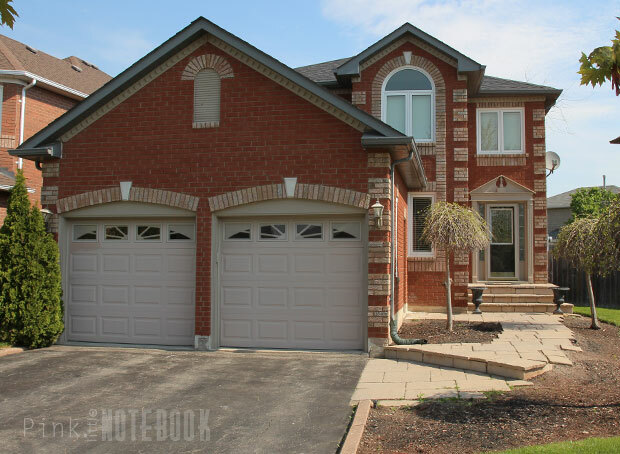 As you may recall, this project initially started due to a number of exterior repairs that we could no longer ignore. We needed to do something fast and this was the year to do it BUT I couldn’t wrap my head around doing all this work and not seeing any visual difference. So I added a mini facelift to the mix! 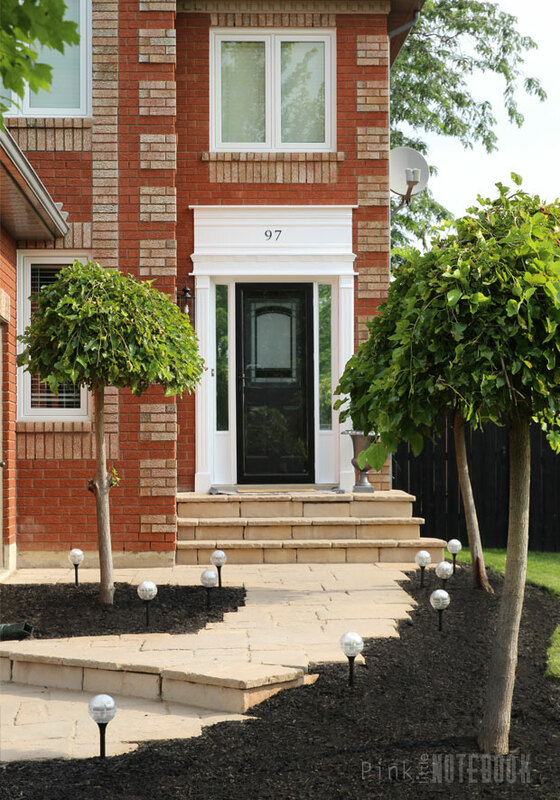 It’s kind of amazing to watch how a few tweaks and lots of paint, can easily revive your curb appeal. We managed to get a lot done in between our busy summer schedule. For the most part, some projects worked out great, some didn’t go as planned and some were added last minute. I’ll go through all the details in just a minute. So without further ado, I’m thrilled to present to you our before and after shots. What do you think? It looks totally refreshed, right!?! 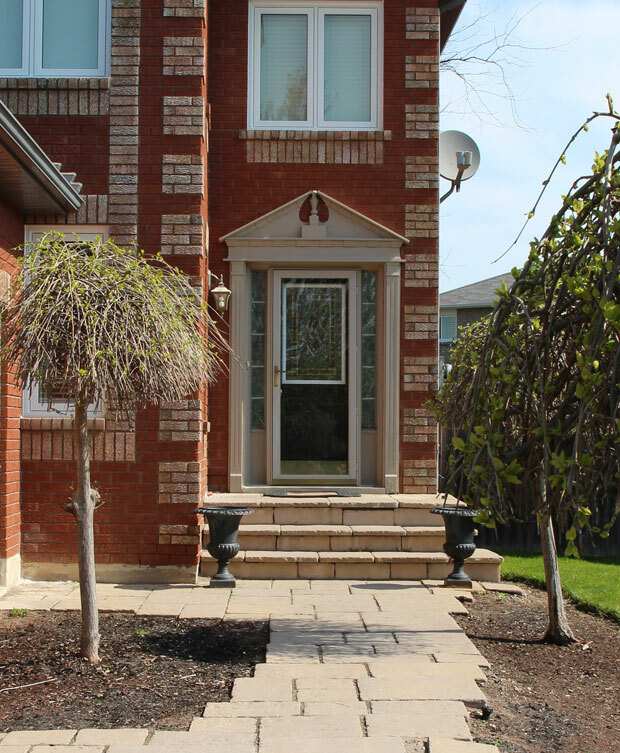 This project consisted of many small projects like repairing our crumbling concrete walls and re-painting the wood trim around our home. 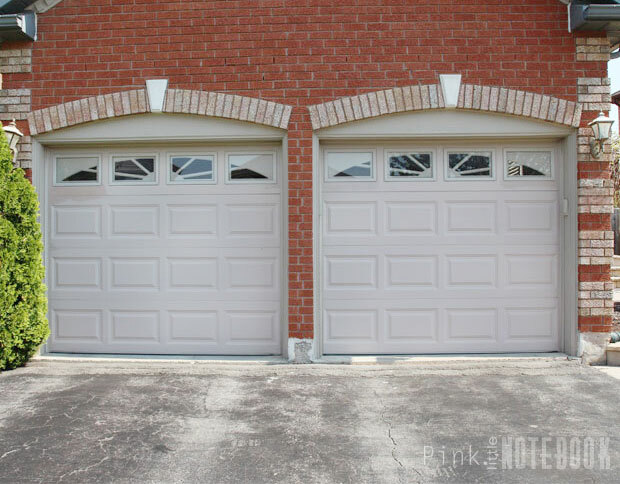 Then we had some larger projects like replacing our garage doors, which of course, we left to the pros. 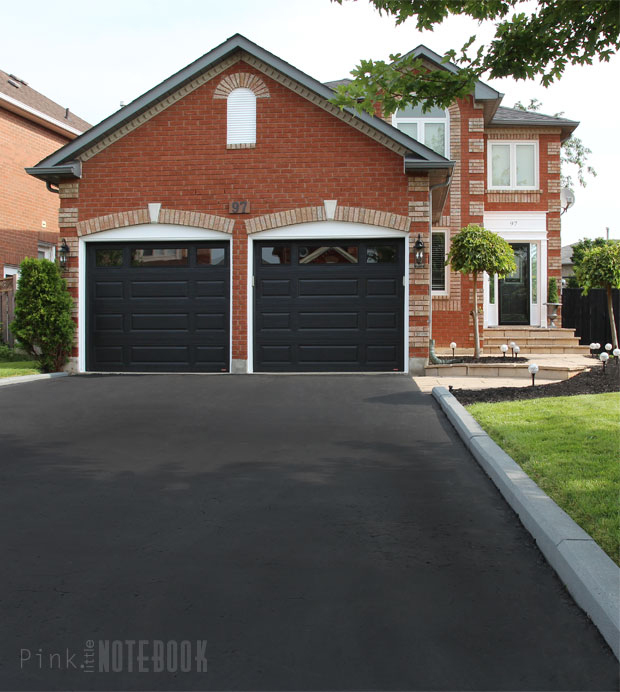 Not only has this made the biggest impact visually but it’s such a relief to know that we installed one of the most durable garage doors on the market. And did you notice our brand new driveway? We sealed it and it looks fantastic. Our driveway is actually pretty old with a ton of cracks. This new coat of paint just makes your eyes skim right over it all. Our once pink concrete curbs are magically grey now. This was definitely another painting project worth all the sweat—well my husband’s sweat—he had to move them all to the garage since it was raining non-stop at the time. I’ll be posting all the details about both these projects very shortly and why we added it to the list last minute. Our landscaping is as bare and minimal as it gets—I know. I can’t even tell you how many times I’ve heard our parents say, “why don’t you plant something out front?”. But here’s the deal, I’ve got a black thumb and an surface area way too large for a beginner to mess around with. For now, we filled it with black mulch and I will revisit this once I master the art of flowers and shrubbery. I had some big plans to build a new and improved gate system but this project didn’t happen this summer so we just stained the gates black. We’ve also got new light fixtures! These fancy outdoor wall lantern make me extremely happy every time I see them on. Our stone pathway is looking sharp, thanks to one of our repairs (view all the details here). The stones on the right side were literally sloping away from the path. Even with all this rain this summer, we still have no movement (yay!). Lit pathways are a must! Our friends at Deelat sent us these amazing solar powdered LED lights. Did I mention, they are three-in-one? They can be used as lawn lights (as shown here), they can float in water or be hung and and used as a pendant. Oh yes, I’m going to have fun with these! 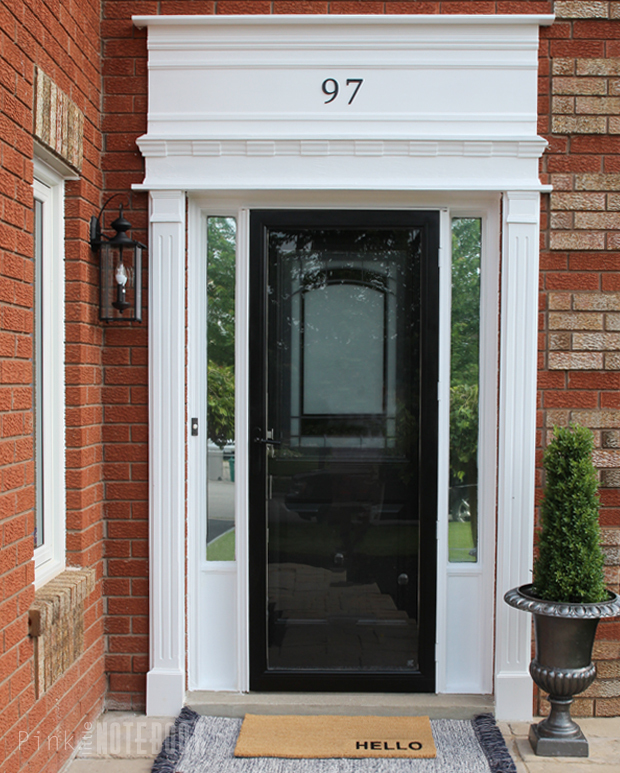 Remember our existing exterior entrance? We made a few tweaks to update the look of the molding and repair some of water damage we had. I just love how this turned out and it was such a cheap fix. You can read all about this project in my previous post. 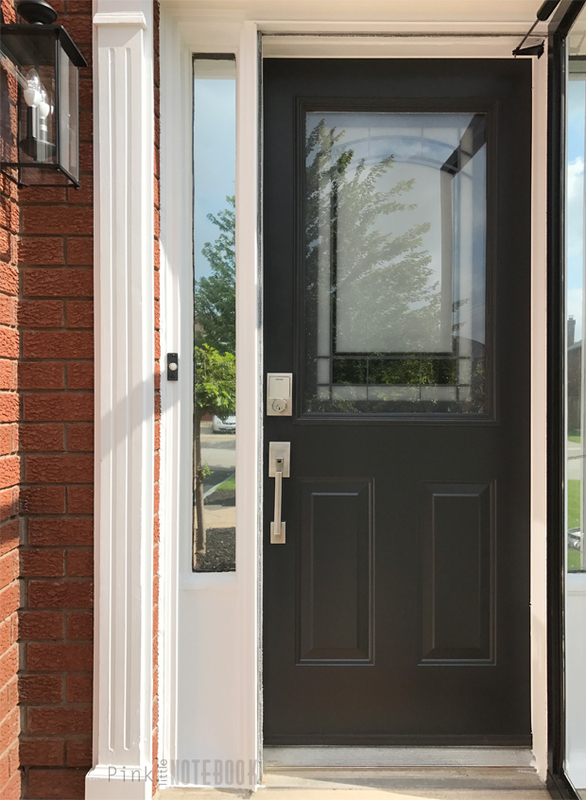 The front door is original to the home, although it does need to be replaced, we made some minor repairs and cosmetic changes to it in the meantime. We painted, added new weather stripping, changed out the insert glass, added a mirrored privacy film and installed new door hardware (<—which has basically changed my life!). I can’t wait to go into more detail about what we did in an upcoming post. And that’s a wrap! Our exterior makeover is (for now) complete. You can view all the sources below. Let me know if you have any questions. Cheers to enjoying the rest of the summer! 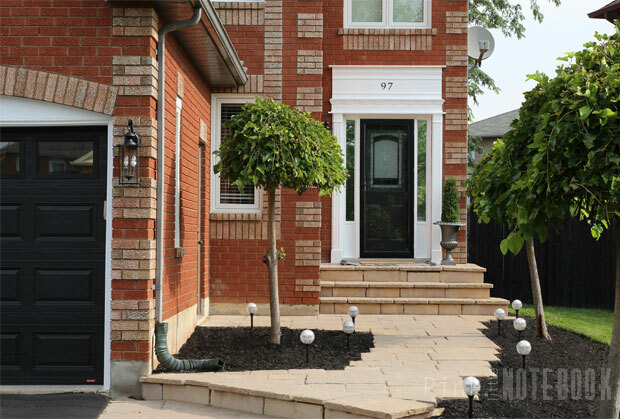 *Click through these links to see more about our exterior makeover: Updating our Curb Appeal, How to Repair your Crumbling Concrete Wall, Our new Garage Doors, Fixing a Walkway with Sinking Stones, Reviving our Exterior Front Entrance, Exterior Update, How to Renew your dated Driveway & Curbs, Five Ways to Upgrade your Front Door. Its AMAZING! I love the update – so classy and polished. ALSO – get professional help with picking plants. I just moved to a new place and bought a bunch of gorgeous flowers and THEY ALL DIED. Turns out its because I picked ‘full sun’ plants and planted them in a place with a leeetile too much shade. Anyway, ask for the RIGHT plants and it will help tremendously. Right! It’s not an easy job, there’s so much to know about plants. Thanks for the tip, I will definitely seek professional help. Thanks for your kind words! It really pops now! It looks so beautiful! 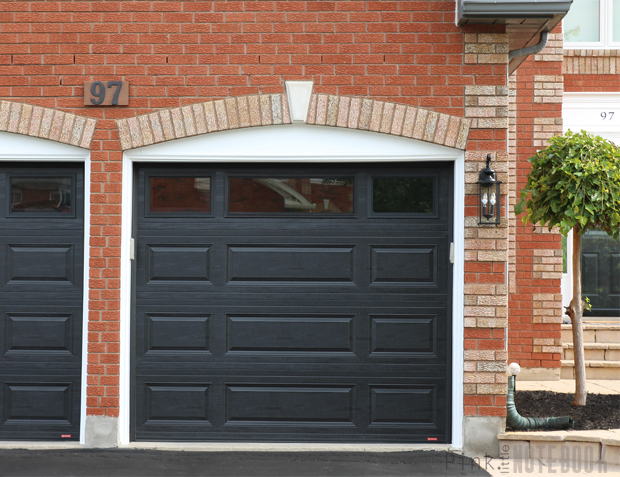 I love that you did black garage doors! It’s a color you don’t see very often. We love our new garage doors! Thanks for the kind words Amanda! Sabrina, your home looks gorgeous. 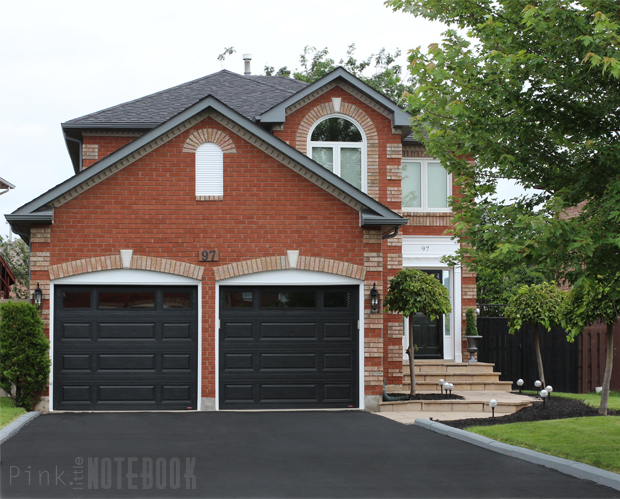 This is one of the best exterior updates I have read and seen all year. The brick looks so fresh and I love how you even painted the curb and sealed the driveway. Great job! Thanks so much Lisa! We’re so happy we’ve made these changes. It feels like we gave new life to our home! Awesome transformation! The new garage color really pops! It’s amazing what a little paint can do! Thanks so much Kallie! This looks awesome. You did a great job. Amazing makeover. Thanks for sharing. Aww thanks so much Isabela! I just can’t seem to skip a day without reading your blog. Everything in it just fascinates me, specially that you are able to send the message across very well. Thanks again Sabrina! Thanks for sharing your inspirational work with us. Please keep it continue. Great article, thanks for sharing this Sabrina. The transformation looks absolutely incredible, you’ve done an amazing job here. So much work, and really worth it. Thanks for sharing! Love the brickwork and glad you saved it, some might have covered it over.